I need to move the 490 litre display tank that is in my lounge so that we can have new flooring put in. I only have some limited tank space right now (6 tanks spare, two of which contain fry), so have decided to temporarily lend some of my Hemigrammus bleheri to the 60 litre project tank. I moved 2 females and 4 males on the 4th of January and am planning to move another 6 fish on the 9th of January. So far, the seeded filter has coped with the additional stocking without any problems (ammonia and nitrite are at a clear 0 ppm). On 1st of January 2012, this tank was moved from Berlin, Germany to UK. The move took around 48 hours and was successful, with a 100% survival rate of fish, plants and equipment. Unfortunately, I have since not had enough time to dedicate to appropriate research for the new posts, so the blog was put on hold. Last month, this project met a rather abrupt and an unexpected end: I was away from a couple of weeks in the US, and during that time, without my knowledge, the filter was unplugged. On my return, I found no sign of vertebrate life in the tank. This has happened even though the people who were in the house while I was away knew the importance of a running filter. The three items that are highlighted are the ones that I have referred others to most often, as they are usually the most misunderstood and clouded in myth. Of course, this is not the end for the tank and I will soon be setting it up again. 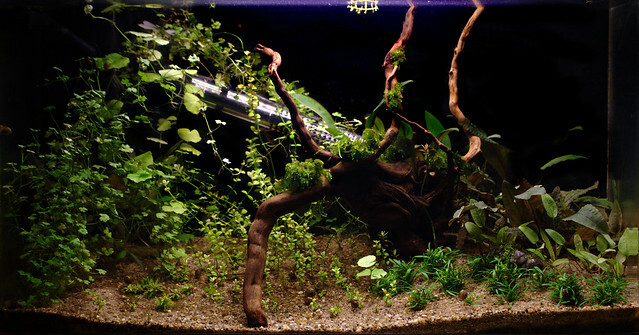 I do not have much preference for set-up, other than it be a biotope, so I welcome all suggestions in the comments! Anything from a detailed set-up to a species that the rest of the tank should be created around would be considered. Next time, I plan to explain how to seed a filter from an existing tank, and whatever else is requested. In the mean time, I am using it to grow plants that fund my hobby. The 10 Yunnanilus loaches that I bought from Welsworld turned out to be Y. brevis, not Y. sp. ‘rosy’. The mistake is easy to make because the juvenile Y. brevis have very similar colouration to adult Y. sp. ‘rosy’ and I was not able to view the fish before collecting them. I have emailed the seller explaining the mistake and asking whether they are able to swap the loaches for the correct species. If not, I should be able to return the fish as they are not what I ordered. Y. brevis grow to double the size of Y. sp. rosy and come from Inle Lake, so would be more suited to a 90×30×30 biotope with Danio erythromicron. Danio margaritatus was first “found” for the aquarium trade in August 2006 and was quickly described by Roberts as Celestichthys margaritatus, which is where “celestial pearl” comes from. Apparently there was quite a hurry to get the first paper out as a few groups were trying to describe the species at the same time. It was only a year later that the species was moved to the genus Danio by Conway. This unusual little fish was originally found near the town of Hopong, in the same area as the similar Danio erythromicron, but unlike D. erythromicron, which comes from Inle Lake, D. margaritatus is found in small, shallow ponds with a high amount of vegetation. Over the next few years, more collection points were discovered, including in more areas around Hopong and as far as Thailand. The fish became so popular due to its small size that in a matter of months, large parts of the habitat where it was originally found had apparently been destroyed, which triggered a blanket ban on export, but the Danios proved easy to breed, so captive bred specimens were almost immediately available. The fish appears to retain its beautiful colour when bred in captivity, while wild caught specimens are difficult to feed, so one should aim to only buy captive bred fish. It would be irresponsible to continue encouraging the destruction of a habitat through purchasing wild caught specimens. 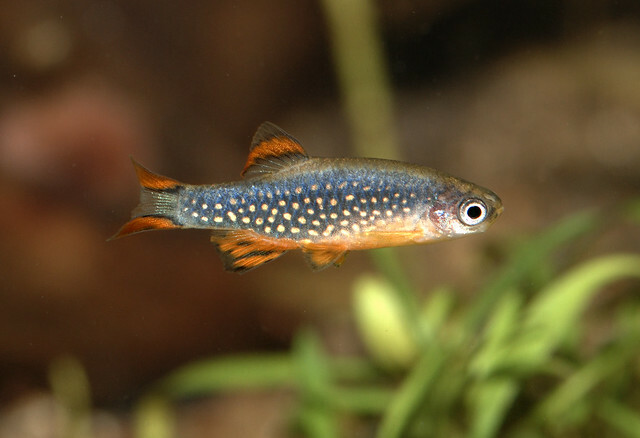 A couple of the more positive side effects of this species becoming so popular was the increased income of the local fishermen, who were paid 20 times more per fish when selling to the aquarium trade than when selling the fish locally for food, and an increase in availability of other dwarf species, such as Boraras, in the aquarium trade. The recorded SL was 21.2 mm for a holotype male and 20.5 mm for a paratype female. It is quite possible that the species may grow slightly larger, especially since the specimens I bought are already around 20 mm, while the breeder said that they would grow another 30%, so would reach around 28.6 mm. Unfortunately, I was not able to see the parent fish to confirm this. The temperature, as recorded by the closest weather station, which is approximately 400 metres higher above sea level and 30 km away, ranges from an everage low of 8 °C to an average high of 29 °C. From this, I would assume that the water temperature that the fish are found in would be within 15 to 25 °C, which is in line with what the breeder I bought them from told me: he said that the fish showed best colouration at 20-22 °C, losing most of its brilliant colouration at 25-26 °C. I had already assumed as much, which is why I set the aquarium heater to 20 °C as soon as the cycle was complete. This way, the fish should show best colouration for most of the year, only losing it in the summer, when air temperatures reach 30-35 °C. Due to its natural habitat, this species is most likely best suited for small, shallow and well planted aquaria with low current. 60 × 30 × 30 cm aquarium seems to be ideal for the species as males may fight in smaller aquaria, but the fish “get lost” in larger aquaria. The majority of the plants found in the area were from the Hydrocharitaceae family, although the fish seem content with anything which provides a thick cover. This species is compatible with most other small, peaceful aquarium fish which prefer plants and a slow current. Most of the Asian species I list as suitable for 60 litre aquariums should be comptible. The fish’s diet appears to consist mainly of small invertebrates, although they readily take dry foods. For best colour, it is advised that the fish are fed a varied diet, including a large proportion of tiny live foods such as newly hatched Artemia and small water fleas. Due to the small stomach which is appropriate for the size of the fish, I would recommend that this species is fed small amounts of food often, for example, at least twice per day, although I expect that they would do well without food for a few days when kept in planted aquaria. After a lot of searching online and in local fish shops, and one failed attempt to buy the fish from a breeder in the next big city (Potsdam) because the breeder sold them to someone else instead of waiting a day for a reply from me, I found a listing on eBay Kleinanzeigen (a classified listing website). While not as close as my usual fish shop, the fish were only an hour away by public transport, door to door, which was an improvement on 55 km that I was thinking that I would have to travel to find the not-so-local local breeder that I had found through a forum for local fish keepers. This breeder was only at home from 19:00, so I made an appointment to see the fish and, after becoming slightly lost looking for the entrance to the apartment block, found myself walking into a small lounge with three aquaria. The breeder asked me to sit by one of them and observe the fish inside, while he told me about how he looks after the Danios. The Danios were bold, well coloured and a healthy shape, with the females being full of eggs. In short, these were by far the best D. margaritatus I had ever seen. After 10 minutes or so, the breeder showed me the foods he uses, which were newly hatched Artemia, frozen water fleas and high-protein dry foods. He explained that the fish hatched in July, and were power fed (fed small quantities of high protein foods often) so that they were now 70% of their adult size. After I confirmed that I was very happy with the fish, and he made sure that I had the details for his frozen foods supplier, he started catching out the fish into a bucket, while I observed his other aquariums. He had a lovely nano aquarium, which was suspended from the wall, containing a beautiful pair of young Badis badis, a planted 2 metre aquarium with Pterophyllum scalare and Paracheirodon axelrodi, and a rack of breeding aquariums, one of which contained Hemiramphidae (halfbeaks). Once the breeder had the 10 Danios in a bucket, I counted them and he proceeded to transfer them to the fish bag that I had brought along. Since the journey was short and it was 20:00 by this time (so quite cold, around 5-10 °C), the fish were packed with 90% water and 10% air. Under normal conditions, for example form an fish shop or for long journeys, the fish would be packed with 10-25% water and the rest air, as the oxygen that is in the bag is all that the fish will have for breathing for the whole journey. Once the fish were double bagged, I paid the breeder and headed home. The trip home took slightly longer than expected as one of the trams was late, but because of the unusually high volume of water and a few layers of bags between fish and air, the water did not chill much. I arrived home at around 21:00 and proceeded to drip acclimatise the fish, which took 3 hours. Unfortunately, I forgot to test the water parameters for the record, but I expect that the breeder has roughly the same water as me given that he pointed out that he uses tap water. Once the bucket was full, I transferred the 7 males and 3 females to the aquarium, topped it up with dechlorinated tap water and headed off to sleep. Last night, I finally got the new fish for the 60 litre aquarium and since the cardinals had grown nicely, I decided to move them over into the main aquarium, so I now have 25 cardinals and approximately 20 harlequin rasboras for schooling fish. The photo above was taken about a week ago, on the day I received some new Crypts (although it doesn’t look like a Crypt to me), which are now settling in nicely. I also took out the big piece of Mapane root and improved the arrangement of the caves in the process. As can be seen from the above results, the difference between that and the aquarium water is quite significant! If I was to move the fish straight over, they would probably get quite a shock from the difference in hardness, so I would need to acclimatise them first. The more common method involves floating the bag in the aquarium for a short period of time and occasionally adding large volumes of water to it: this does not particularly help the fish become accustomed to the new water and can be as harmful as not acclimatising at all. From what I have seen, this is one of the most common reasons, after ammonia poisoning, for deaths in new fish. Fish are osmoregulators, which means that they regulate the water levels inside their bodies by means of a process called osmoregulation to keep the salt concentrations inside their body constant, regardless of the fluctuations of salt outside their bodies. The process differs in freshwater fish and marine fish because of the environment, I will write about the freshwater process as that is what concerns this aquarium. Some species of fish, such as some Poecilia spp., are able to tolerate a very wide range of salt concentrations in water, all the way from fresh to marine water: these fish are called euryhaline. But most (common freshwater aquarium) fish are not able to tolerate changes in salinity: they are referred to as stenohaline. Water hardness is made up of metal ions and carbonates, both of which form salts, so harder water contains more salts than soft water. This means that it takes more work for fish to maintain body salt concentrations in softer water and less in harder water: keeping hard water fish in soft water can affect their health as they would constantly be putting more effort than is usual into maintaining their bodily functions. Most fish have a blood salt concentration of 9 ppt, while fresh water has a salt concentration of under 0.5 ppt, so freshwater fish tend to try to maintain salt concentrations in their blood at higher levels than the water is at, which is achieved by ion intake through food and gills and by excretion of excess water by means of a dilute urine. Most fish are not able to instantly adapt between different water hardnesses, which is why moving a fish from one water type to another quickly can result in death or serious injury. To avoid problems, it is important to acclimatise the fish to the new water parameters over a long period of time and with only small changes in the water parameters. In theory, if the start and end water hardness, pH and temperature are same or very similar, acclimatisation can be skipped. Long term exposure to water types the fish are not suitable for cause increased susceptibility to diseases, because of the extra work that hard water fish have to do in soft water and because many diseases do not do as well in soft water, so soft water fish are not always as able to resist them.